Sweet, earthy beets become a refreshing chilled soup in this easy, flexible recipe. 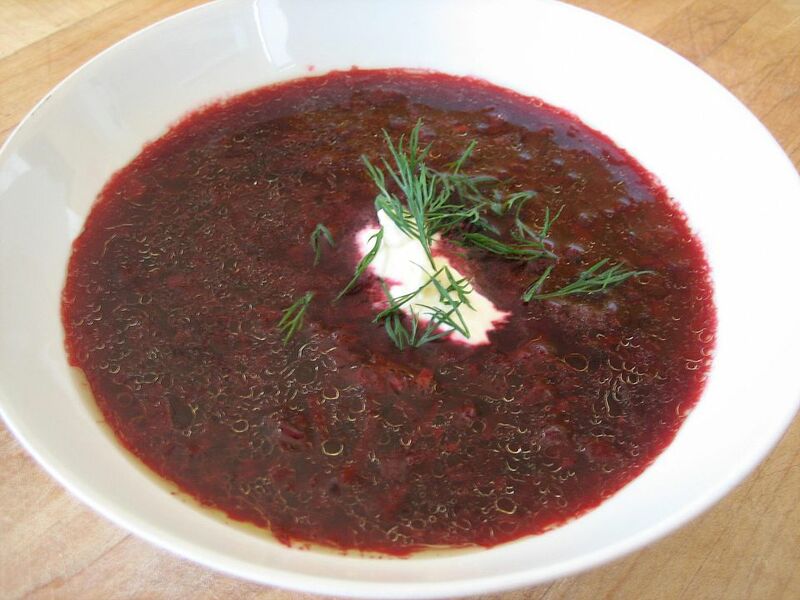 Serve it pureed smooth or leave it with pieces of grated beets floating in the sweet, red broth. Either way, it's chock full of vitamins and entirely refreshing. It makes a delightfully fresh start to a bigger dinner, or a perfectly light and refreshing meal when the weather is beyond hot. A dollop of sour cream or yogurt is optional, of course, but that bit of creaminess is the ideal foil to the sweetness of the beets. Serve with crusty bread to sop up any bit of soup clinging to the bottom of the bowl when you're done spooning it up. In a large pot over medium heat, cook onion and salt with 1/4 cup of the broth until the onions are soft, about 3 minutes. While they cook, peel and mince the garlic, if using; add it to the onions and cook, stirring, until fragrant, about 30 seconds. Add the broth and reduce the heat to low. Peel the beets and then grate them on a large hole grater over the pot so they fall right into the broth. Note: handling raw peeled beets with bare hands will lead to some staining. It usually washes away with a few washes, but wear gloves if you wouldn't want pink under your fingernails in the next few days! Once all the beets are grated into the broth, bring everything to a boil. Reduce the heat to maintain a gentle simmer and cook until the beets are very tender about 15 minutes. Optional: For a creamy soup, whirl the soup in a blender or food processor, or with a hand-held immersion blender, until smooth. Add salt and pepper to taste. Serve the soup hot or chilled, and garnish with yogurt, sour cream, or crème fraîche and/or herbs, if you like. * Since this soup is served cold, any fat in the broth will congeal, and likely float on the surface of the soup. Some people may not mind, but others would find it unappetizing.